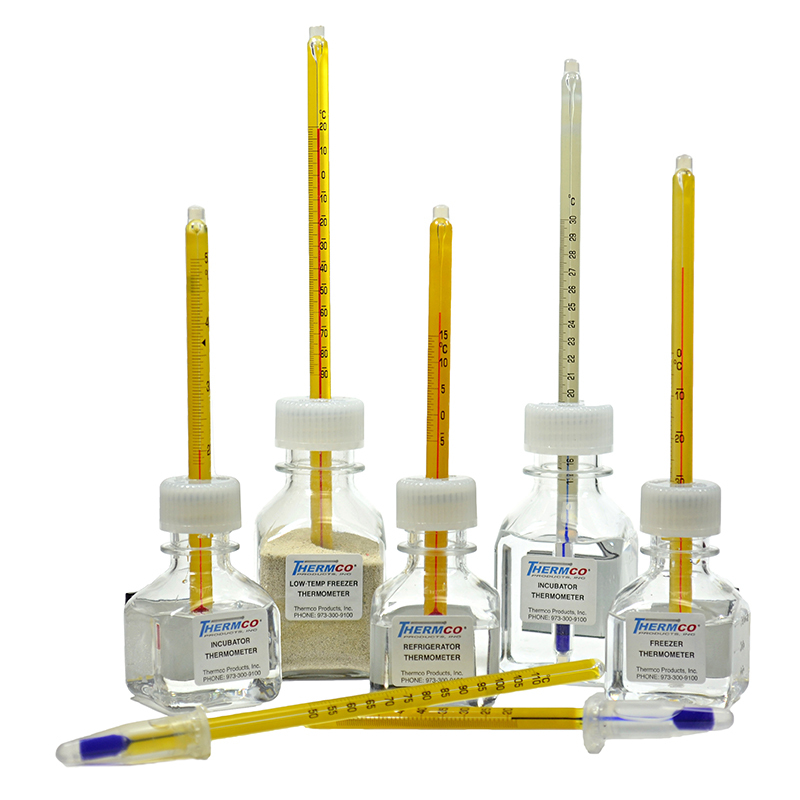 Non-Mercury thermometers sealed in a PTEF jacket that contains liquid & glass if breakage occurs and are housed in unbreakable plastic bottles filled with a non-toxic Bio-Safe medium. Economical, Precise and Reliable means of measuring critical temperatures in Blood Bank Refrigerators, Ultra-Low Freezers, Freezers, Refrigerators, Incubators, Ambient/Room, Block Heaters and Ovens. 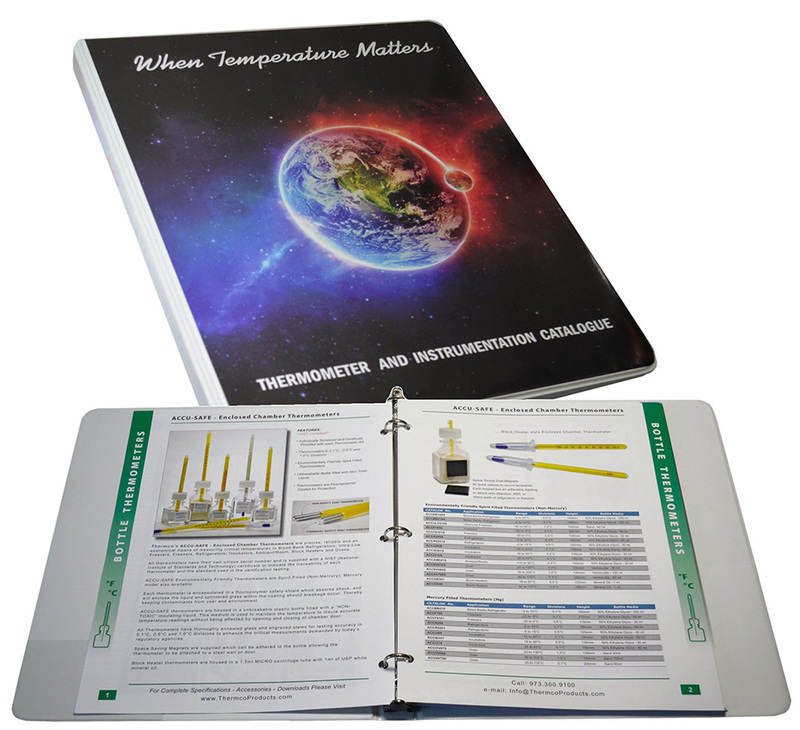 Each bottle thermometer has their own unique serial number and are supplied with a NIST Traceable Certificate. Thermco’s ACCU-SAFE - Enclosed Chamber Thermometers are precise, reliable and an economical means of measuring critical temperatures in Blood Bank Refrigerators, Ultra-Low Freezers, Freezers, Refrigerators, Incubators, Ambient/Room, Block Heaters and Ovens. 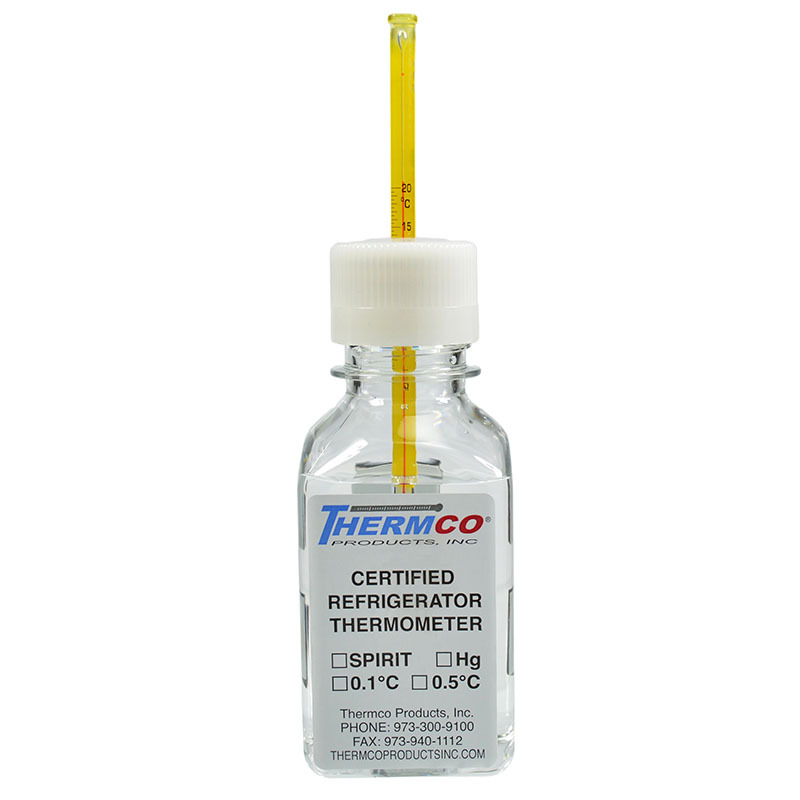 All thermometers have their own unique serial number and is supplied with a NIST (National Institute of Standards and Technology) certificate to indicate the traceability of each thermometer and the standard used in the certification testing. 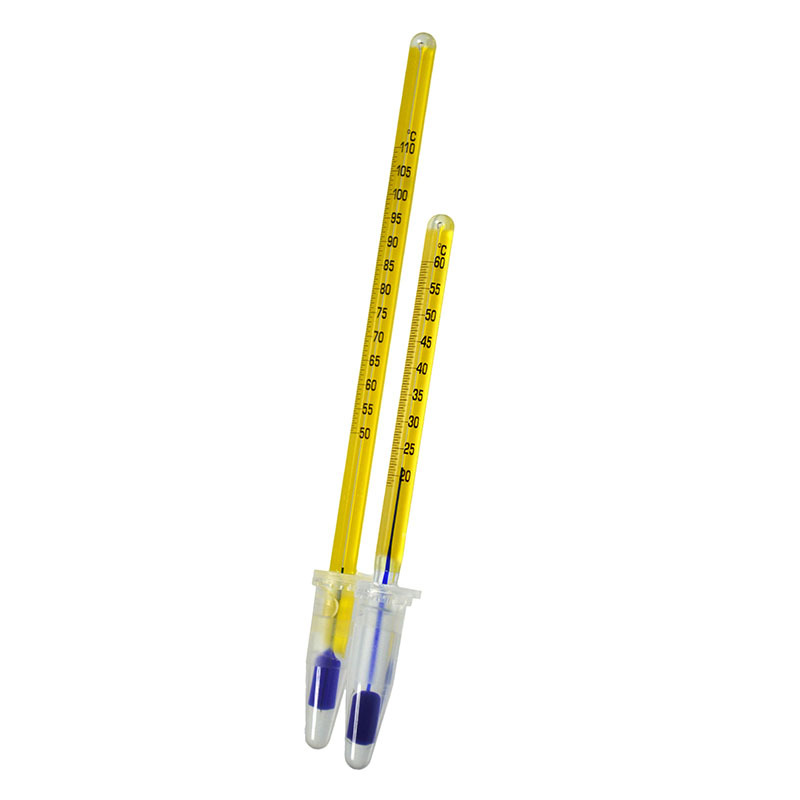 ACCU-SAFE Environmentally Friendly Thermometers are Spirit-Filled (Non-Mercury). Mercury model also available. 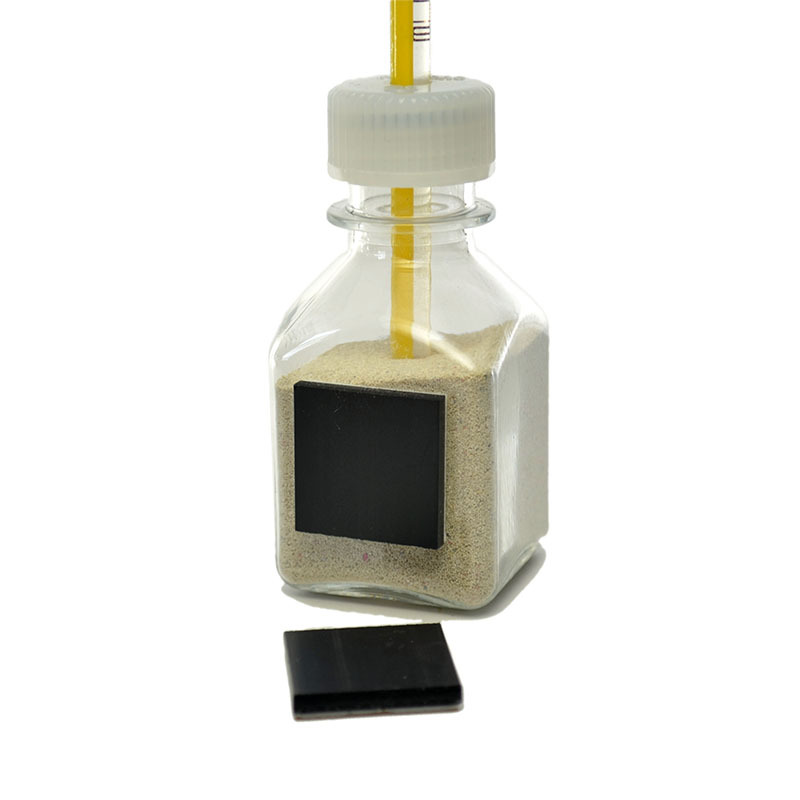 Each thermometer is encapsulated in a PTEF flouropolymer safety-shield which absorbs shock, and will enclose the liquid and splintered glass within the coating should breakage occur. There by keeping contaminants from user and environment. ACCU-SAFE thermometers are housed in a unbreakable plastic bottle filled with a “NON-TOXIC” Bio-Safe insulating liquid. 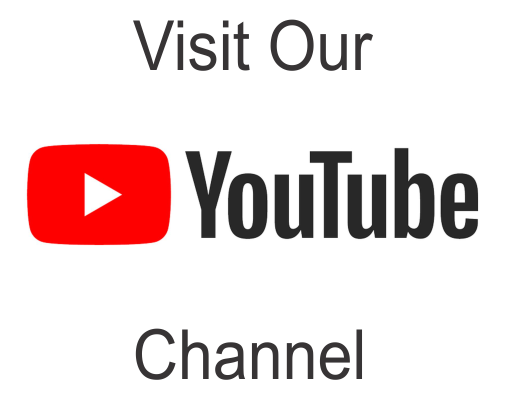 This medium is used to maintain the temperature to insure accurate temperature readings without being affected by opening and closing of chamber door. All Thermometers have thoroughly annealed glass and engraved stems for lasting accuracy in 0.1°C, 0.5°C and 1.0°C divisions to enhance the critical measurements demanded by today’s regulatory agencies. Space Saving Magnets are supplied which can be adhered to the bottle allowing the thermometer to be attached to a steel wall or door. 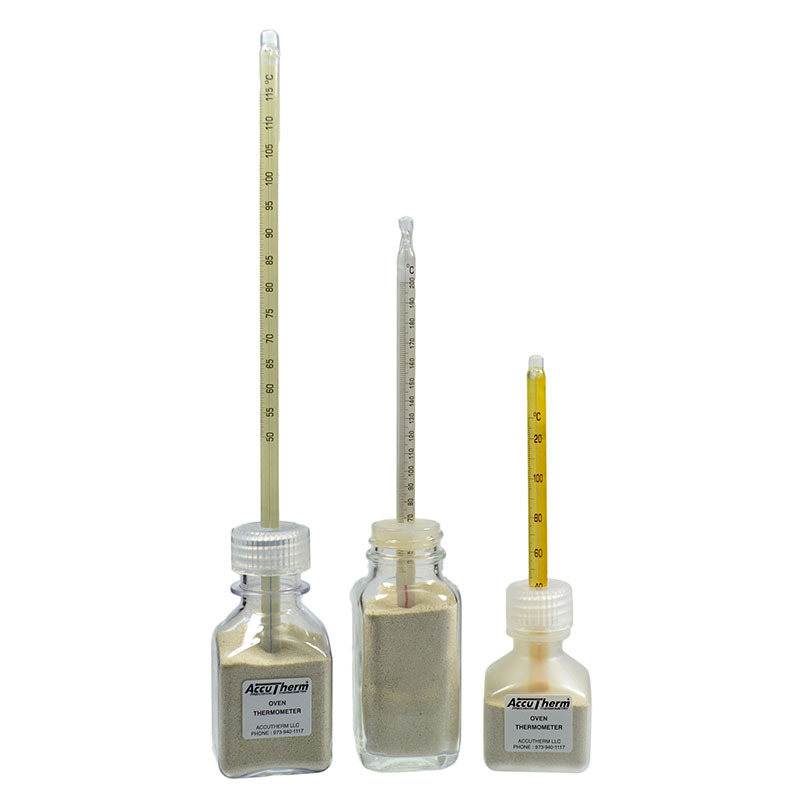 Block Heater thermometers are housed in a 1.5ml MICRO centrifuge tube with 1ml of USP white mineral oil.